The Hudson-Webber Foundation in Detroit today announced more than $3.1 million in grants for projects that support small business development and long-term neighborhood stability, fund new research into the connection between immigration and neighborhood revitalization in Detroit, expand physical and program enhancements to the Detroit riverfront, and support initiatives to develop and strengthen Detroit’s community development system. The organizations approved for grants are Building the Engine of Community Development in Detroit, Detroit RiverFront Conservancy, Global Detroit, and Midtown Detroit Inc.
“We’re proud to support partners that are deploying innovative approaches to improve neighborhood vitality, whether it be through the development and stewardship of welcoming and transformative public space, planning, and coordinating investment in specific geographies, using high-quality research to identify policies and programs that foster neighborhood stabilization, or developing a more coordinated community development system,” says Melanca Clark, president and CEO of the Hudson-Webber Foundation. Building the Engine of Community Development of Detroit (BECDD) has been awarded a two-year, $300,000 grant to support a locally driven and collaborative process to strengthen neighborhoods through a coordinated approach for community development work in Detroit. The BECDD initiative, created in 2015 with core partners Community Development Advocates of Detroit, the Michigan Nonprofit Association, and Lawrence Technological University, builds on three years of engagement and planning with over 150 stakeholder partners and intensive research on community development models across the country. The grant will support the implementation of pilot initiatives that will shape the creation of a long-term, effective community development system in Detroit that achieves more equitable development and revitalization in all Detroit neighborhoods. Midtown Detroit Inc. (MDI) has been awarded a three-year, $750,000 grant to support ongoing community and economic development programming that advances small business development, public space maintenance, mixed-income housing, and cultural vibrancy in the Midtown and New Center neighborhoods. MDI serves both as a catalyst, helping to attract investment to the neighborhood and a “change manager,” helping to ensure that those investments are responsive to the needs and aspirations of Midtown residents. 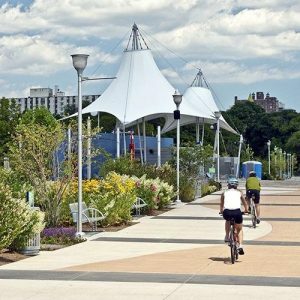 The Detroit RiverFront Conservancy was awarded a five-year, $2 million grant to support capital expansion and enhancement of park infrastructure along the Detroit riverfront, as well as supporting annual programming and operations. The grant will support the Conservancy’s five-year plan, which includes development of a new beach and social space between Chene Park and Jos. Campau Street, including a playscape and street-side pavilion incorporating food and small-scale retail outlets; green space redevelopment at the Uniroyal site to connect the RiverWalk with Belle Isle; and the development and construction of the West Riverfront Park, which was launched as a community-led public design competition in 2017, and will undergo construction starting in 2020 and be completed in 2022. Global Detroit was awarded a $95,000 grant to conduct a research study that examines the connection between immigration, neighborhood stabilization, and revitalization, focusing on Detroit and Hamtramck neighborhoods with significant and recent immigration growth. The research will be conducted by Global Detroit in partnership with Alan Mallach, senior fellow at the Center for Community Progress, an accomplished urban researcher with significant experience in Detroit. The study’s findings are expected to deliver insight and analysis that will inform public policy and community development practices. Global Detroit deploys research-informed strategies that mobilize Metro Detroit’s immigrant potential to revitalize Detroit neighborhoods, and strengthens the region’s economy through strategies that create jobs and build prosperity for all who live in the region. Hudson-Webber Foundation grants over $7 million annually to promote community and economic development, arts and culture, built environment, and safe and just communities, with an interest in policy and advocacy activities. Previous grantees in 2018 include the United Community Housing Coalition, Detroit Public Safety Foundation, the Local Initiatives Support Corp. (LISC), Jefferson East Inc., the Detroit Justice Center, the Belle Isle Conservancy, and Michigan Future Inc. The Hudson-Webber Foundation origins date back to 1939 with major contributions from Mr. and Mrs. Richard H. Webber, other members of the Webber family, and J.L. Hudson Co. The foundation is governed by a 17-member board of trustees, has assets of approximately $170 million, and has contributed over $200 million to improve the quality of life in Detroit.